... with strips of oriented-strand rock wool. The system offers excellent sound/thermal insulation and fire performance. thermal insulation / stone wool / rigid panel / fire-resistant MEC W.
Rock wool is one of the family of non-flammable mineral wools. It offers good thermal and acoustic insulating properties. The dry air incorporated into its structure limits thermal conductivity to between .032 and .040 W/m.K. It also absorbs sound, diminishing vibrations and echoes. 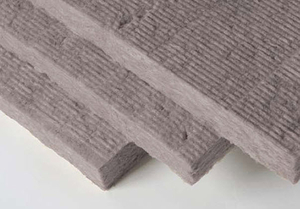 This insulation is used in attics, ceilings, inclined roofs, partitions and other locations. It is available in semi-rigid panels, balls, and rolls. Installers should wear goggles, mask and gloves for protection against airborne particles. Such material is durable, resists compression and retains its mechanical properties at high temperature without giving off gases. It also absorbs water vapor and is more moisture-resistant than fiberglass insulation.